The Fourth of July or Independence Day, July 4th has been a federal holiday in the United States since 1941. But the origination behind this tradition goes back to the 18th century and the American Revolution (1775-83). So let’s take a trip down memory lane to learn about his memorable day! In modern day American, Americans celebrate Independence Day on the Fourth of July each and every year. Americans celebrate July 4 as a day that represents the Declaration of Independence from Great Britain and the birth of the United States of America as an independent new nation. So let’s go back to the 18th century to see what made the 4th of July a day of remembrance! July 4, 1776, wasn’t the exact day that the Continental Congress decided to declare independence from Great Britain. The Continental C Congress declared America’s independence on July 2, 1776. So what did actually happen on July 4th, 1776? The Continental Congress approved the final draft of the Declaration of Independence on July 4th, 1776. The Continental Congress has been working on it for a couple of days after the initial draft was submitted on July 2nd. On July 4th, 1776, the Continental Congress finally agreed on all of the edits and changes. 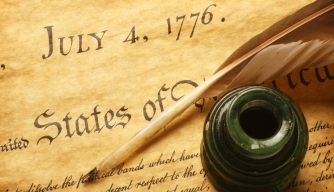 July 4th, 1776, then became the date that was included on the newly approved Declaration of Independence. July 4ht was also the date that was printed on the Dunlap Broadsides; the original printed copies of the Declaration of Independence that were circulated throughout the new born nation. That’s why when people think of the Declaration of Independence, July 4th, 1776, is the date they remembered. But how did the 4th of July become a national holiday? For the first 15-20 years after the Declaration of Independence was written, people didn’t celebrate the 4th on any date. The declaration was too new, and there was so much else happening in the young nation. By the 1790s, a time of bitter partisan conflicts in this newborn nation, the Declaration had become a subject of controversy. One party, the Democratic-Republicans, admired Jefferson and the Declaration of Independence. But the other party, the Federalists, thought the Declaration was too anti-British and too French for their taste, which went against their current policies. Yah I know the Democratic and Republican Party were one! You learned something new today! By 1817, John Adams complained in a formal letter that the new America seemed uninterested in its past. But that changed shortly after that. After the War of 1812, the Federalist party started to come apart, and the new parties of the 1820s and 1830s all considered themselves inheritors of Thomas Jefferson and the Democratic-Republican Party. Printed copies of the Declaration started to circulate again, all with the date July 4th, 1776, listed at the top. The deaths of Thomas Jefferson and John Adams on July 4, 1826, even further helped to promote the idea of July 4th as an important date to be celebrated. Celebrations of the4th of July became more common as the years went on and in 1870, almost a hundred years after the Declaration was written, Congress first declared July 4th to be a national holiday as part of a bill to officially recognize several holidays, including Christmas. Further legislation about national holidays, including July 4th, was passed in 1939 and 1941. Here you have it! The entire history from the beginning till today! Since 1941 and to date, July 4th has been a time of celebration! It’s a time of festivities ranging from extravagant firework shows, parades, and concerts. It’s also a great time for family gatherings and barbecues. I hope you enjoyed this history lesson today! Happy 4th to all my American readers~! Join me in congratulating America and All Americans of this joyous day!